We have the astonishing capacity to vigorously defend what isn’t working. When this happens, we eventually blame others for nagging issues. After all, someone has to be responsible for these frustrations. Believe you’re right, even though what you’re doing isn’t working. Pour more energy into the same strategies when you’re spinning your wheels. 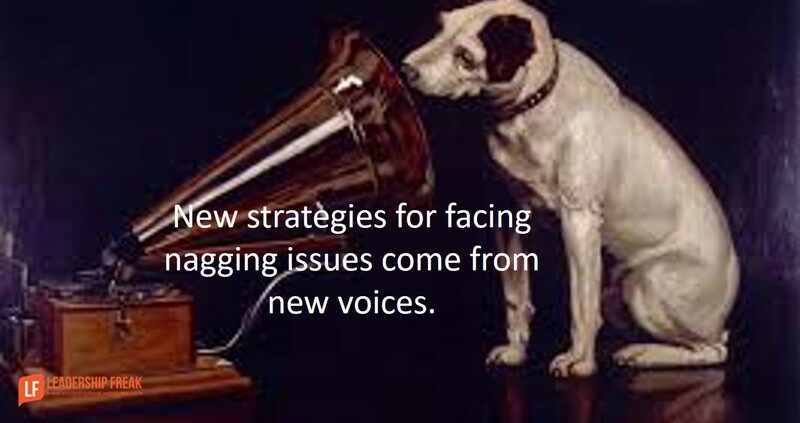 New strategies for facing nagging issues come from new voices. #1. New eyes see and state the obvious. Gradual development is less effective when you’re stuck. A new voice turns the lights on by saying the same things in new ways. #2. New voices intensify the gravity of the moment. Business as usual goes out the door when a new person enters the conversation. A little discomfort is a good thing, especially when you’re stuck. #3. New perspectives reveal what’s important to you. We lose sight of our values after grinding away for a long time. Reconnect with what you really want by noticing how you judge new perspectives. #4. New people bring new feedback. What’s working? What’s not serving you well? A new person at the table is one way to address the issue of defending what isn’t working. How might leaders address the challenge of defending what isn’t working? *Heather’s comments are focused mostly on bringing in a second internal coach. I thought there was opportunity to expand her thoughts to the general topic of dealing with being stuck. I could never figure out why most humans don’t like change, desire consistency…even if what they have been doing ‘isn’t working’! The truth is, the only thing constant in life…is change. I tend to crave change. Great food for thought, thanks and have a good weekend Dan. I think some of sticking with what doesn’t work is around the fact that what people want isn’t change, they want progress. Change alone is not necessarily an improvement: if you get run over by a bus, your life will change, but it probably won’t be better!